Cloche and nuno felted cowl. 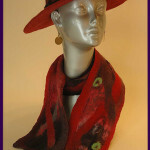 Broad brimed hat and nuno felted scarf. After graduating from Oberlin College with a degree in Studio Art, I came to Maine to study photography in 1981. I was captivated by the natural beauty of Maine and it has been my home ever since. For many years I worked primarily as a land surveyor, part-time as a Maine Guide of sea kayaking and seasonally where I continue to work, at Fedco Seeds, a co-op mail order seed company. My more creative endeavors were relegated to whatever free time I could squeeze them into. 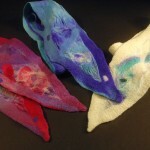 In 2006 I took my first felting class, and I was hooked! I’ve long been attracted to the fiber arts. Felting is a medium that lets me indulge my desire to play with fiber and color and turn those efforts into a variety of functional pieces. 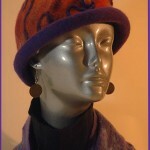 It also gives me great pleasure to see someone light up when they try on one of my hats or scarves! I am happy to be a member of the Northeast Feltmakers Guild along with many other inspiring and talented felters. 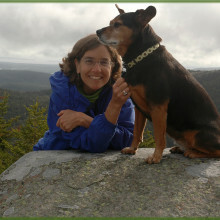 I live in the woods of central Maine with my husband, who is a sea captain, and our beloved animals. When I’m not felting or working at Fedco, I also enjoy hiking, swimming, culinary arts, gardening, paddling and rowing. It’s a very good life!